Classic pasta salad recipe made with Italian dressing, cucumbers and tomatoes. I keep this (or a version of it) in the fridge this time of year. When the days (and therefore, our schedules) are longer, it’s an awesome side dish to have on-hand at supper time and makes a great light lunch. The kids just eat around any ingredients they don’t like. I change it up a bit, adding whichever veggies look good or are on sale at the market. This is just a good base recipe for the amount of pasta and salad dressing. Feel free to make it however you like! I call it Picnic Pasta Salad because this is what I like to bring to picnics, barbeques or covered-dish events during the spring or summer since it doesn't have any mayonnaise or mayonnaise-based dressing, you don’t have to stress too much over keeping it cold. Cook pasta per manufacturer’s instructions for al dente preparation in liberally salted water. Drain pasta and rinse in cold water until pasta is cool to the touch. Drain well. Combine pasta with remaining ingredients and stir to combine. Refrigerate until ready to serve. That sounds really good. Going to make this. Greetings from weekend potluck. It would be fun to make this over the summer holidays. I'm making my own version of a pasta salad for our church picnic tomorrow!! It is a GREAT addition during the summer! Your photos are lovely and I have to try that Greek version with the feta! The days don't "get longer" in the summer. 24 hours are 24 hours. The daylight lasts longer but thank you SO much for taking the time to drop that little pearl of wisdom! I love your response to Music Box...some people's children. I can't wait to try this. All 3 recipes sound delicious! Totally agree. I love-love-love the longer summer days. I don't know about you, but I do so much more in the summer - that it feels like there are more than 24 hours in the day. Looking at the photo makes my mouth water! If it wasn't midnight I'd go make a batch right now. Never tried adding green olives to pasta salad but since I love snacking on them , it makes perfect sense to throw some in. Thanks Mandy for using part of your "longer day" (lol) to post this recipe. Going to make this up today! 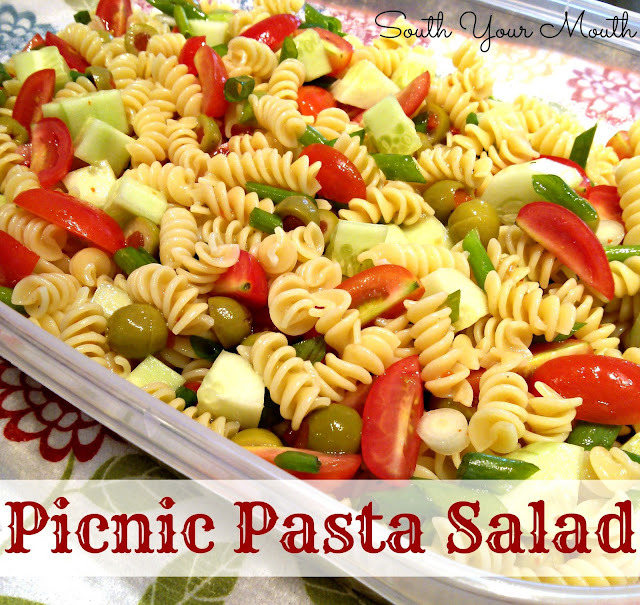 Love having a go to pasta salad in the fridge this time of year and this one looks perfect! Hope mine will be as delightful looking as that which you have in your photo.